In March 2013, the Mayor of London launched his Vision for Cycling in London. Derived from this vision, several initiatives are being developed to improve provisions for cycling across London including; Quietways, Cycle Superhighways, the Central London Grid and a number of other road and infrastructure projects. Quietways are signed cycling routes aimed at complementing other cycling initiatives by encouraging less confident or non-cyclists to take up cycling on quieter streets and also providing for existing cyclists who want to travel at a gentler pace. The proposed routes are expected to have minimal changes to the street and will link key destinations across London, improving the cycling experience for all. 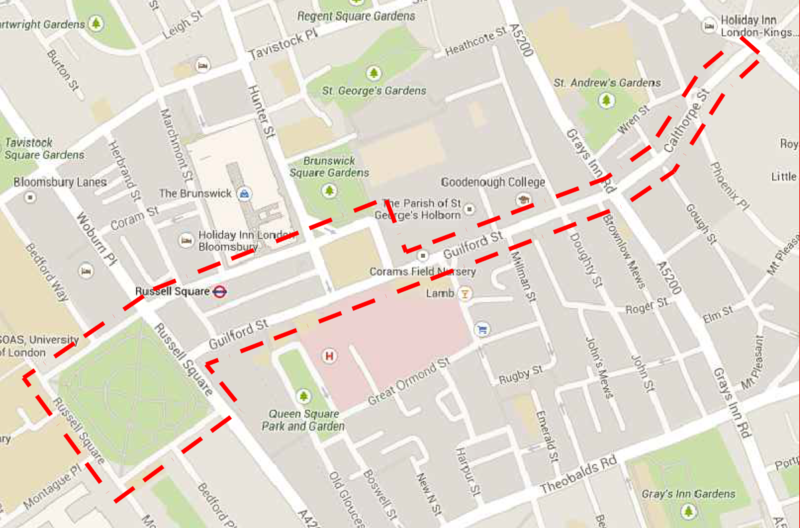 Of the seven pilot Quietway routes, the first two are proposed to be delivered by spring 2015. The Bloomsbury to Walthamstow route (Quietway 2) will include cycling improvements in Camden, Islington, Hackney and Waltham Forest boroughs and Lea Valley Regional Park. These improvements have been developed with Transport for London. Place cycle symbol road markings on the road in each direction. Introduce cycle wayfinding signs at major decision points along the route. To improve cyclist comfort, introduce new cycle friendly grates to cover drains. Replace existing granite setts from raised areas (on road humps and raised junctions) with asphalt. Remove 3 No. cycle hire docking stations on the southern footway of Guilford Street opposite Lansdowne Terrace and realign the kerb to remove a pinch point on the road. Narrow pavement on the southern side to accommodate a cycle lane. Build-out pavement and raise crossing to pavement level. Widen pavement and raise road to pavement level. Provide new cycle parking and additional motorcycle parking. Widen pavement and realign traffic islands with centre of road. Raise whole junction to pavement level. Below is a visualisation showing how the proposed Quietway signs and road markings could look. We need your views as this consultation is intended to find out if there is broad public support for the proposals. Only ONE reply per household, business or organisation will be accepted. For views to be considered, please ensure you provide your postal address. While it will not be possible to reply to you individually, all comments will be taken into account. The Cabinet Member for Regeneration, Transport and Planning will make a decision in February 2015 whether to proceed with the scheme and you will be informed via the council’s website of the outcome of this consultation within three months. Under the Local Government (Access to Information) Act 1985, we may not treat your response confidentially, as it will be available for public inspection. Please only write to us about the consultation issue. If you want to comment on any other matter, please use a separate letter. All properties within the consultation area outlined on the map below, local and statutory groups, emergency services and Ward Councillors. All responses received from the online and postal surveys will now be processed and taken into consideration for the progression of the scheme. The Cabinet Member for Regeneration, Transport and Planning will make a decision in February 2015 whether to proceed with the scheme and the public will be informed via the council’s website of the outcome of this consultation within three months.